Two people have died after a swarm of spiders swept through a secluded area in India. A further seven villagers have been bitten after the eight-legged creatures invaded. Healthcare professionals at the hospital in Sadiya town said the victims were treated with antibiotics after witch doctors attempted to release the poison by cutting the wound with razor blades. Officials said this is a dangerous procedure and could cause more harm to the person suffering than the bite of the spider itself. They added that they were unsure whether the venom from the bite caused the death of the two people in the Tinsukia district, or if the locals' treatment was responsible. According to an expert from Dibrugarh University in Assam, the spiders could be an undiscovered relation of the tarantula family. Ecologist LR Saikia said: "It looks like a new species. We haven't been able to identify it." 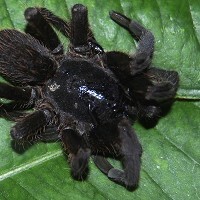 The bite victims cannot be administered anti-venom treatment because the new species have not yet been classified, and they cannot receive them until officials identify what type of spiders they are. Explorers and travellers are advised to take out medical travel insurance in case an attack similar to this happens. Residents in the village are now keeping the area well-lit at night with lamps, while also standing guard to prevent more hairy spiders from invading their huts.